The O’Connor Steelhead, a.k.a. 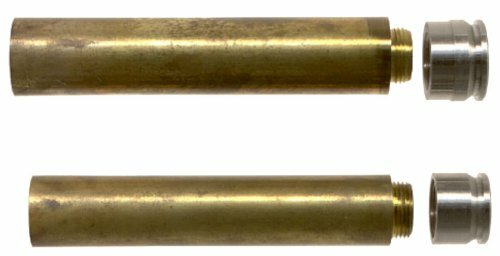 Ramhead, line of unformed rifle cases with tempered stainless steel screw-on bases were introduced to the shooting public in 1984. 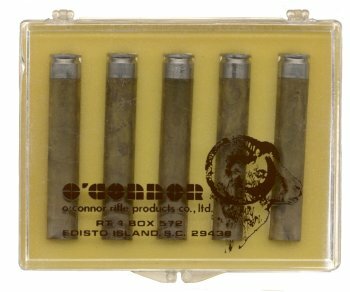 These were touted by their maker, the O’Connor Rifle Products Company, Ltd. of Edisto Island, South Carolina as a “totally new concept in handloading” that “increases powder efficiency and velocity.” They were sold in two different sizes; the .30-06 and the belted 7mm Rem Mag head sizes, with .280 Rem, .222, .308 and .375 H&H magnum “coming soon.” The cases were also available in .50 BMG on special order. 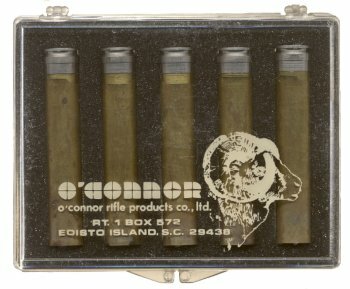 .30-06 size O'Connor "Steelhead" case- note that these were sold as unformed cases which could be formed to many diferent calibers. The basic idea was that the steel heads could safely withstand a much greater pressure than brass, therefore, a handloader could load to higher pressures for greater velocity. The instructions for forming the cases involve progressive runs through a series of dies and then fire-forming. Because of the case design, with its threads and separate steel head, powder capacity was less than in a standard case. The ’06 dummies shown are two of twenty made by O’Connor on special request. Sectioning by Chris Punnett. O’Connor factory reps displaying their new cases at a Savannah, GA gun show were very surprised to learn that the idea of a reloadable cartridge case with a screw-on steel head was not new, but went back about a century. This information put somewhat of a damper on their plans to patent their “totally new concept,” which of course was not new at all.